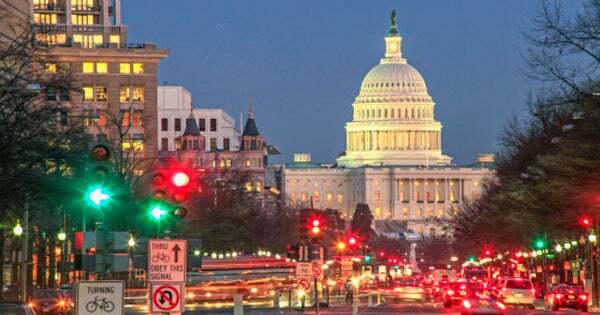 RUSH: Now to Tillerson and all of this going on in Washington. I want to ask you if you remember something. Didn’t the media…? Didn’t the media tell us…? I mean, way, way back. I’m talking here near… It may even be during the transition, but it was around the time Trump selected Tillerson. Didn’t the media tell us that Trump picked Tillerson to be secretary of state as a payback to Russia for Russia helping Trump win the White House? You can look it up. My memory does not fail me. You remember all of those stories about how friendly Tillerson was with Putin? And we were told, “Well, you know, he’s the CEO of ExxonMobil, and Exxon has business interests all over the world because they’re pumping oil and causing climate change all over the world! So Tillerson has an intimate relationship with all these nations, presidents, strongmen, dictators, whatever. He has to because he does business in all these countries, and he’s got a really, really good reputation with Putin and a good relationship with Putin.” He was essentially very, very friendly with Putin, and we were told this is why he was chosen because Putin helped Trump win by screwing Hillary. Oh! Have you seen the video of Hillary in India? She fell down the steps twice, had to be propped up. You’ve probably heard about the speech that she gave. Have you heard about that? (interruption) Oh, gee whiz! The woman cannot let go of it. But it’s instructive. Anyway, she walking down the steps, and if you didn’t know it was Hillary… Yeah, you’d know. There’s one telltale, physiological… You’d know. But, I mean, she can barely walk down these steps. They’re stone steps. She slips twice, almost does the splits like a cheerleader except she can’t go that far. She’s propped up by two guys twice, and Huma is just standing behind there looking at this as though it happens all the time. Nobody seems particularly ruffled by this. Hillary’s wearing this gigantic straw hat with sandals and white slacks that go down about, oh, just leaving the ankle exposed. And she can’t walk! She cannot walk down these steps. Anyway, she’s in Mumbai. She’s made all these comments about why she lost, and it’s pathetic. But, at any rate, we were told that since Putin helped Trump, that Trump picked Tillerson as payback. 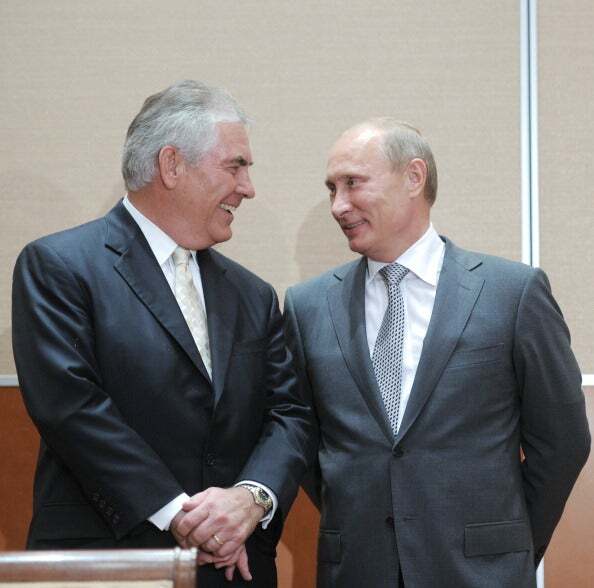 Remember, Putin even gave Tillerson the Russian Order of Friendship. The Washington Post reported that in December of 2016. “Tillerson won the award after signing deals with the state-owned Russian oil company whose chief is seen as Putin’s loyal lieutenant,” and it’s interesting to note that since Tillerson became secretary of state, he has indeed taken positions that are sympathetic with Russia. He sided with Russia and Obama on the Iran nuke deal when Trump thinks it’s horrible and needs to be ripped up — and that was a major sore spot for Trump. That and Tillerson is apparently a genuine believer in climate change, and that is something, a point of friction between him and Trump. I thought Tillerson’s climate change position was simply a CEO saying what he had to say to keep half of the Exxon customer base mollified. But it turns out that Tillerson actually may be a true believer in it. Whether he is or isn’t, the point is Trump isn’t, and it was another friction point. So Tillerson being fired is a slap in the face of Russia, if we’re going to take the media stories in December 2016 seriously, that Tillerson was chosen as a payback to Putin for Putin helping Trump getting elected. That was Joe Scarborough. They were watching Mussolini! I think what’s happening, folks… I think Trump is on a roll. I think if you look at Trump’s agenda on taxes, on the economy, on the tariffs… A big steel company just announced they’re opening a new plant in Ohio. They just announced it today, a thousand new jobs, reopening a steel plant. But if you look at Trump’s agenda, 65% of it already achieved, I think Trump’s just hitting his stride, frankly. I think he’s on a roll. I think that he’s getting confident and comfortable. Did you hear him say, “I don’t really need a lot of advisers. You know, I don’t need a bunch of strategists. I made up my mind on a lot…”? I think Trump is totally capable of making up his mind on things. He doesn’t rely on advisers or strategists nearly as much as the Washington establishment is used to. I think he’s just hitting his stride. I think Trump is getting more and more confident, and I think now it’s time for Trump… He mollified some people by choosing cabinet members that might not have been his first choice. But he was making a mistake that freshman Republicans make consistently, thinking you can sue for peace or buy peace with the media, with the Democrats, with the opposition. So he picks people that the Drive-Bys are gonna swoon over and applaud and approve and so forth, but they’re not Trump people. It’s obvious Tillerson was not a Trump person. Tillerson, CEO ExxonMobil. That’s not a job where you report to anybody. It’s not a job where other people tell you what to do. As CEO of Exxon, you’re telling everybody else what to do, not just inside your company, but outside. Tillerson, I think, believed he had a free hand at secretary of state, that foreign was basically his. You remember last summer there was a leak that Tillerson had called Trump a “moron” — and that was denied by both sides. But what if Tillerson really thought that and thought that foreign policy was his, and when he shows up and starts implementing his version of it that’s in direct opposition to Trump, conflict, something has to give. So rather than this being chaos, rather than this being, “Trump’s losing control; nobody knows what’s going on in the White House,” I think it’s the exact opposite. I think Trump is on a roll. I think he’s gaining confidence, and now, “To hell with it!” He’s putting Trump people, people he likes, people he believes in, people who understand him, people who like him and that he likes. He’s putting them in key positions in his inner circle. It’s a positive. RUSH: Rex Tillerson. I still like the name. 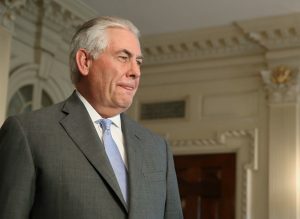 I’ve always liked the name “Rex Tillerson.” It’s a great name for the CEO of a major oil company. I don’t know if it’s a great name for secretary of state, though, but it’s a great name for an oil company head honcho. Rex Tillerson. He says he doesn’t know why he was fired. Well, let me try to help out here. If you’re butting heads with the president on three key issues… Tillerson said nothing was gonna happen on North Korea. He was not even told that that deal had been made to go accept the invitation from Kim Jong-un. And the Iran deal! Trump hates the Iran deal, has made no bones about it. Tillerson apparently is trying to keep us in it. And then there’s this whole Paris accords climate change thing, and there probably some other riffs, not to mention the “moron” comment. Whether it was made or not, it was reported. It’s floating out there. I don’t think it’s personal here. I think Trump… As I say, he’s hitting his stride, and I think that he’s putting people in these key positions to help him get his agenda moving and accomplished. I think he’s leaving people in the dust here, folks. RUSH: One other thing: Rex Tillerson was opposed to moving the embassy in Israel to Jerusalem. So that’s four things that Trump and Tillerson disagreed on, and they are significant. And you add to it the fact that (as best I have been able to ascertain this morning) Tillerson really did think he had autonomy. Look, personality types are what they are, and Tillerson hasn’t reported to anybody on the job in I don’t know how long. You’re the former CEO of Exxon. You’re not a wallflower. You’re not sitting around waiting for somebody’s approval. You’re a proactive, go-out-and-get-things-done kind of person. He really thought, from what I’m told, the State Department was sort of like a personal fiefdom — as it has been, by the way, for others. You know, Obama would put people in there and just let ’em run because he knew that he basically had put himself in there. Well, that’s what Trump is doing. Mike Pompeo! Mike Pompeo. Do you know he finished No. 1 in his class at West Point? He’s from Kansas, a former member of Congress. He’s already been confirmed as the CIA director. He’s gonna have to go through confirmation hearings again. Those are gonna be interesting. The Democrats are gonna try to stall as much of this as they can because it’s an election year. Also, Trump has named the first woman to run the CIA. She’s been the deputy director of the CIA. The deputy director actually is the day-to-day operations person of the CIA anyway. The deputy is actually who implements stuff. The director is not a figurehead, but the deputy — which is what she was — means that she’s been doing the job anyway and is eminently qualified for this. But I think if you look at this simply as Trump finally getting people in place… You have to understand something, folks. In Washington, there aren’t too many people happy Trump is there. In Washington, it would be not difficult at all to choose somebody to be in your cabinet who doesn’t like you. What percentage of the Washington establishment or people that work in government at any level with any degree of experience in anything — how many of them — like Trump? His universe of people is pretty small. And I think he’s realized this. I think Trump’s learning a lot about liberalism that he didn’t know — I think Trump is learning a lot about leftists that he didn’t know — because Trump is becoming more conservative instinctively as he goes. But, believe me, it’s a win-win to put people in positions where his agenda is implemented and maintained, people that are on the same page has he is. Remember I told you… I’ve made mention of this I don’t know how many times. A lot of Trump’s staffing decisions during the transition in the early days after the inauguration really puzzled me. You ever done this? I have. Pretend that you’re running for president, pretend that you win, but nothing else about your life changes. Just one day, you’re out there doing what you do, and one day you decide to run — and you win. Now you have to pick a secretary of state. Now you have to pick a secretary of commerce and on down the line. You’ve gotta pick somebody to lead your Council of Economic Advisors. You have to pick somebody to go over to Commerce. You have to pick somebody at the Food and Drug Administration and the EPA and all this. How many of you know anybody who is expert in any of those areas? So since you don’t, and since most of us wouldn’t, where would you go? Who would you rely on for advice? Who would you go to find people to staff your cabinet? If you’ve never been in politics, and all of a sudden you run for the top gig in the country and you get it…? I ask myself this all the time because I try to find out… You know, George H. W. Bush is the first president… Well, maybe Reagan. But George H. W. Bush is the first person I actually tried to figure this out. I looked his cabinet. Like Bob Mosbacher was secretary of commerce, and he was great, and he was also a very tight buddy of George H. W. Bush. They’re both in Texas, both in Houston. Mosbacher was a perfect fit. Now, Bush had been in government all his life, so he had the pick of the litter. He knew everybody. James Baker actually was a Bush man before he was a Reagan man, and some people said he never became a Reagan man, that he was always a Bush man, meaning he was never his conservative as Reagan was. But that’s the position Trump was in. I don’t know if Trump knew Tillerson before he ran for president. Maybe he had met him. I don’t know if he knew Mike Pompeo. I just don’t know. 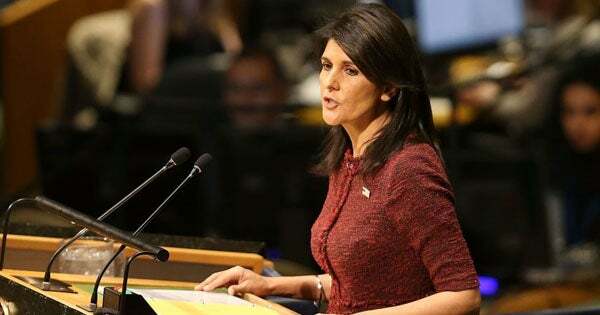 But to know people well enough to put them in these positions… Nikki Haley at the United Nations, the ambassador. So at some point you do have to rely on people that you trust to make recommendations to you to put people in your cabinet. When that starts happening, that’s when it can all go wrong. What if you’re asking people who don’t want you to succeed? What if the suggestions you’re getting are not the best fit for you? Say you’re relying on… Pick. I don’t care who it is. You’re relying on somebody to advise you on picking a secretary of state, and what if that person really thinks you have no business being president so you need somebody in there that’s gonna actually run foreign policy for you since you’re such a dodo bird. What if Trump was relying on somebody to give him advice? Not just secretary of state, but any other position? My point is that now that Trump’s got a year under his belt and has gotten to know people and has seen them in action and now has an on-the-ground feel for his agenda and how this place work… Now I think he is making moves to staff his administration with people who are on the same page as he is, people he trusts, people that he knows agree with him on what he wants to get done. He said he made the decision to fire Tillerson by himself. He didn’t talk to anybody about it. He didn’t get any suggestions. He didn’t even tell Tillerson. The decision was supposedly made on Friday. He said that he and Tillerson been talking about this for a long time. “A State Department official says Trump never explained to Tillerson the reason why he was fired. He said, ‘I don’t think it needs a reason. '” Now, you can say, “It’s not cool. If you fire somebody, you bring ’em in and you tell ’em face-to-face, or you call ’em on the phone, but you don’t announce it in a tweet.” Well, Trump announced it in a tweet. RUSH: We’re gonna go to George in Augusta, Georgia. George, great to have you. Thank you for calling. You’re up first today. Hello. CALLER: Good afternoon, Mr. Limbaugh. 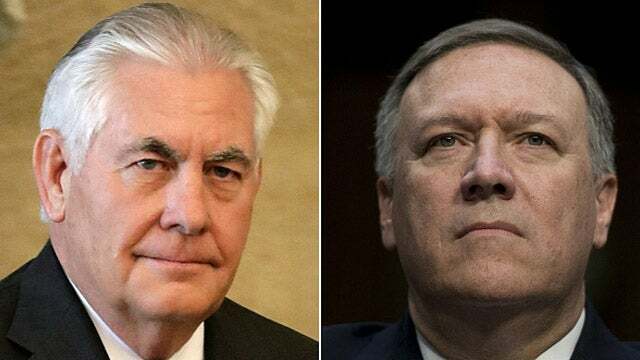 In reference to Mr. Trump firing Tillerson, I think it was a strategic move based on that Tillerson’s a dove, he’s replacing him with Mike Pompeo, who’s a hawk, and getting ready to go into this meeting with Kim Jong-un sometime in May. He’s going to be dealing from a position of strength and not having to worry about making any kind of compromises through Tillerson. RUSH: That’s probably a decent observation. In fact, George here is right. That’s a great categorization, if you want a quick label type explanation. Tillerson is more of a dove or a moderate. Pompeo is a hawk. And what that really means, those two terms have become I don’t think all that valuable, but, like, hawk has a negative connotation to it, depending on who uses it. The best way to describe Pompeo is aggressively pro-America, aggressively pro-American. He’s not wimpish. He’s not defensive about it. I’m not kidding you. The Obama administration had a lot of people, State Department and throughout, that thought they had to defend the greatness of the United States, to apologize for it. Sorry we’re so big. Sorry we’re so powerful. We know that we don’t really deserve it because we’ve done it on the backs of your country and that country. Pompeo is not that. The fact that Tillerson was not even in the loop on the Nork thing, you know, this has to be embarrassing. It was one day last week. It was the day before Trump made the announcement or the South Koreas came out and made the announcement. It was the day before that Tillerson said there’s no talks with North Korea and there aren’t gonna be any. And the next day Tillerson was effectively blown out of the water on that. Any CEO who really, really believes in climate change is likely going to be a dove on a whole lot of things, because if you believe in climate change, there’s one thing else you have to believe, and that is America is at fault. If you believe in this whole left-wing climate change thing business, then you are required, if you’re being consistent, to also believe that America is primarily responsible. Well, you don’t want somebody like that hanging around when you’re heading into talks with the pot-bellied little dictator from North Korea. RUSH: I think another reason why Washington was blown to smithereens today, is nobody gets fired in the swamp. Obama never fired anybody. George W. Bush didn’t. These people screw up left and right. They never get fired. Trump, he’s firing people. Oh, oh, the swamp is taken aback. This doesn’t happen. Gotta be some sort of abnormality, conspiracy or something. It just doesn’t happen. Swamp people don’t get fired. That’s one of the benefits of being in the establishment is you do not get fired. You get reassigned, your kids maintain their health care, you maintain your career and future, but you do not get fired. Well, not in Trump world. In Trump world you get canned and you get called out for it. And people find out why you got canned before you find out. Do not discount this. RUSH: There has been another firing, this time at the State Department. You know, we ought to know better by now. We just ought to know better. This is a great illustration of how every one of us can get swept up and believe caca. “The White House has fired an aide at the State Department who contradicted the White House account of” Trump’s firing of Tillerson. “The Associated Press first reported the firing of Under Secretary of State Steve Goldstein…” He’s an assistant. “The firing was reportedly prompted by a statement from Goldstein on Tuesday, responding to Tillerson’s firing, in which Goldstein said Tillerson did not speak with Trump before his firing and is ‘unaware’ of the reason behind his dismissal. So apparently John Kelly told Tillerson (paraphrased), “Hey! Soon, you’re gone. You’re gonna be gone.” He was not blindsided. He was told in advance. Does anybody remember over the weekend that Tillerson had to cancel some kind of a meeting somewhere because he had become ill? It was in Africa. “He got sick and had to…” That story’s BS. He knew. I predict how that he knew and that’s why he flew back early. We all believe this notion that Trump didn’t tell Tillerson, that Trump tweeted it before Tillerson even knew about it. Because we have some undersecretary in the State Department who says (impression), “Poor little Rex! Nobody told Rex! Trump is a mean SOB! I can’t believe Trump would do this!” That’s essentially the message the guy put out; everybody believes it. So the White House says, “Okay. You’re gone, too, buddy. Get out of there, ‘Rosenstein,’ whatever your name is. You’re gone. Goldstein! You’ve had it,” because Tillerson was told. Kelly told him on Friday he was out. I’ll tell you what. I think they are brooking none of this usual crap in the Trump administration. I actually think I’m right. He’s finding his grove. He’s getting his groove on, folks. He knows exactly what he wants to do now. He’s had a year to size things up and is now cruising and realizes only a certain amount of time to move the agenda forward and knows full well what the Democrats are trying to do to hold him up and stop it, and it’s full-speed ahead, business as usual. RUSH: Rex Tillerson just concluded his remarks relating to his being dismissed by President Trump. He took no questions. We’re editing some sound bites now. He seemed really shaken by this. Really I guess “shaken” is the best word. He was breathing erratically. Wall Street Journal has a story here, the headline: “Tillerson Fired Over Rogue Bid to Save Iran Nuke Deal — The abrupt firing Tuesday of Secretary of State Rex Tillerson follows months of infighting between the State Department and White House over efforts by Tillerson to save the Iran nuclear deal and ignore President Donald Trump’s demands that the agreement be fixed or completely scrapped. Well, hell’s bells. If that’s it, then it’s no wonder. If you’ve got somebody trying to undermine the president’s objectives on this Iran deal, which is another campaign promise, by the way, in addition to being the right thing to do. And if the secretary of state is working with European allies to kind of, “Hey, let’s try to stop our president from succeeding here, he may not know what he’s doing,” I guarantee, once that was discovered, it was over, it was history. See? Wait. Be patient. You’ll eventually get close to the truth on everything. TILLERSON: I received a call today from the president of the United States at a little after noontime from Air Force One, and I’ve also spoken to White House Chief of Staff Kelly. To ensure we have clarity as to the days ahead, what is most important is to ensure an orderly and smooth transition during a time that the country continues to face significant policy and national security challenges. As such, effective at the end of the day, I’m delegating all responsibilities of the office of secretary to Deputy Secretary of State Sullivan. TILLERSON: I close by thanking all for the privilege of serving beside you for the last 14 months. Importantly, to the 300-plus million Americans, thank you for your devotion to a free and open society, to acts of kindness towards one another, to honesty and the quiet, hard work that you do every day to support this government with your tax dollars. All of us we know want to leave this place as a better place for the next generation. I’ll now return to private life — private citizen — as a proud American, proud of the opportunity I’ve had to serve my country. God bless all of you. God bless the American people. God bless America. RUSH: Rex Tillerson said he spoke to Trump. Trump departed today on Air Force One, I think at… Let’s see. What time was this? 10 o’clock. Yeah, because that will put him in out there at noon, yeah, California time. So he called Tillerson from Air Force One. Again, the Wall Street Journal story just moments ago says the reason Tillerson was fired is that he was discovered to have been operating a rogue operation to save the Iran nuclear deal when Trump wants it either majorly fixed or scuttled. Tillerson was working with our, quote-unquote, “European allies” to see to it that Trump’s efforts met failure. I don’t think he’s out looking for friends and associates and so forth. He’s not throwing a party in there and he’s not looking for sycophants. But he’s looking for somebody — ’cause he can’t do everything. He’s looking for people are gonna implement his agenda without having to be told what to do. I can’t tell you how important that is to major CEOs, major managers of a lot of people and a big organization. You have to be able to delegate. You cannot have your hands on everything. It’s just not possible, and you need people who are going to execute your agenda and not undermine it. But I think some of the original staffing was designed to appease. It’s what Republicans do. It’s what Republicans in Washington do. They think they have to do it. They have to show, “No, I’m not what you think I am. I’m not a mean guy. I don’t hate this group and I don’t hate that group. No. Let me show you.” And they don’t really think you hate. Even if they do, that’s not what it’s really all about. It’s forever stigmatizing their opposition, characterizing them, lying about them. It’s not about reforming anybody. It’s not about getting along, at least as far as the left is concerned.